Who builds and maintains the very best molds? The pool is only as good as the mold. Not only does this apply to the finish of the pool it applies to the structure of the pool itself. The mold must be straight for the pool to be straight. 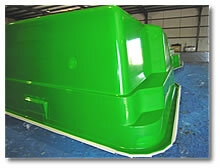 "Laser lined molds" is where each mold is shot with lasers before going into production. The laser is used to identify any variances or miss alignment that would compromise the structure and design of the pool. It is a simple fact that if the mold is not straight, then the installer must torque the shell. This can compromise the structural integrity of the shell such that with as little as 50 tons of water in it may lead to problems down the track. So why risk it? Ask if the mold is laser leveled. Some manufacturers knowingly produce pools that are out of level and offer these to dealers with instructions on how to install the pool and get it level. Please do not let this happen to you, only buy from manufacturers who use laser level molds that are under 10 years old. The end result is a very correct pool with beautiful lines. Consider the lines of a Corvette, Porsche or Ferrari compared to that of an old beat up truck and you start to get the idea. All of the molds used for Luxury Pools are made with steel substructures rather than using wood, which is a cheap alternative. Why use steel? Because steel is very rigid and resists flexing or moving. Wood or timber absorbs atmospheric conditions and can change shape from day to day. Imagine the flexibility over a 40 foot pool from a wooden mold. The pool you make today can be different from the pool you make tomorrow due to the atmospheric conditions. The end result is a pool that is out of level and must be torqued by the installer to get it level when installed. Don’t be fooled. Steel substructure molds have always been used by the pool Luxury Pools installs, and always will be, due to our quality commitments.